Some of my background; I was born late seventies in South Africa, Vereeniging (V-Town for those familiar with the area :-)), went to school in the Orange Freestate and studied in the Transvaal. After my studies I started my career in the petrochemical industry in South Africa. Four years later I moved to Oil and Gas, (downstream) in Scotland and later upstream to the best company and people I’ve worked for, Gyrodata. I’ve spend a few years working offshore internationally until I got a placement to a location in West Africa. Ok, so I’ve spend the last 3.5 years in lovely Luanda (that is in Angola, Africa for our American readers). Had some good times but cannot say this is my favourite part in Africa. Life is hard and challenging in this ever-changing environment………but let’s not dwell on negative, it was another great learning curve and experience. Loosing my little brother in 2008 made me realise life is way to short to sit around and let it pass you by. How is it that we always forget to live while trying to stay alive. I’m sitting in a friends house, homeless, basically jobless, gave up my internet connection, telkom landline and gym membership…my house is parked outside, a small fraction of my clothes are packed tightly into four shelve cupboard and I only have three pair of shoes. I have traded my two bedroom apartment, part-time job at a famous pathology laboratory and finally finished MSc tesis for an adventure I will one day fondly tell my kids about. The story starts with a small town city girl who lived a relatively normal suburban life up till I met the handsome fellow above. I grew up on a farm outside Pretoria with a childhood and parents every child would dream of..I went to a normal primary school, rebelled my way through highschool and was then persuaded to study something. A number of rocky varsity years eventually culminated in meeting an individual that showed me how fabulous life should actually be. Since then I have become the person I use to think I could never be..my boundries have shifted from driving to Durban to flying across the atlantic ocean to watch tango shows in old can-can theatres, being chased by roman spiders in botswana and now venturing into Africa without hair dryer. I have seen more places in the last 2.5 years than people see in a lifetime and I feel so lucky to be included in another amazing adventure. I started life as an operator with the local power generating company in South Africa. In 1970 I met Lillian and got married in 1975. We had two sons, Marius and Nick, who were the focus of our lives. I became an apprentice at the ripe age of 28 and studied after hours for 21 years with the support of my wife. I qualified as a Mechanical Engineer with a number of additional qualifications and retired as Operations Manager in the oil and gas industry in Mozambique. The interesting point is that both our sons qualified as Mechanical Engineers. Sadly we lost our youngest son in a car crash in 2008. One year after he finished varsity. I am a keen outdoor person who loves riding motorbike and do any crazy thing I can think of. 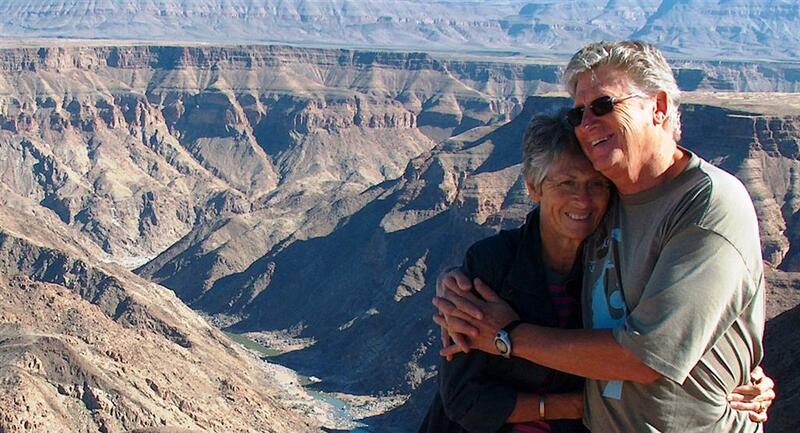 I was fortunate to tour a number of countries in southern African with my wife and two sons. As my family is a very important part of my life we normally travelled alone to improve personal contact and strengthen the bond with the children. I thank God to be this fortunate to do this extensive tour with my son Marius and his gorgeous girlfriend, Debbie. I was born and bred in the Groot Karoo, Hopetown. During the time that I worked as a secretary in Kimberly I met Nick and we got married in 1975. Our two sons also studied engineering as their father did and it therefore goes without saying that I raised three engineers. In 1995 we began scuba diving and it was then that the Africa-bug bit our family. 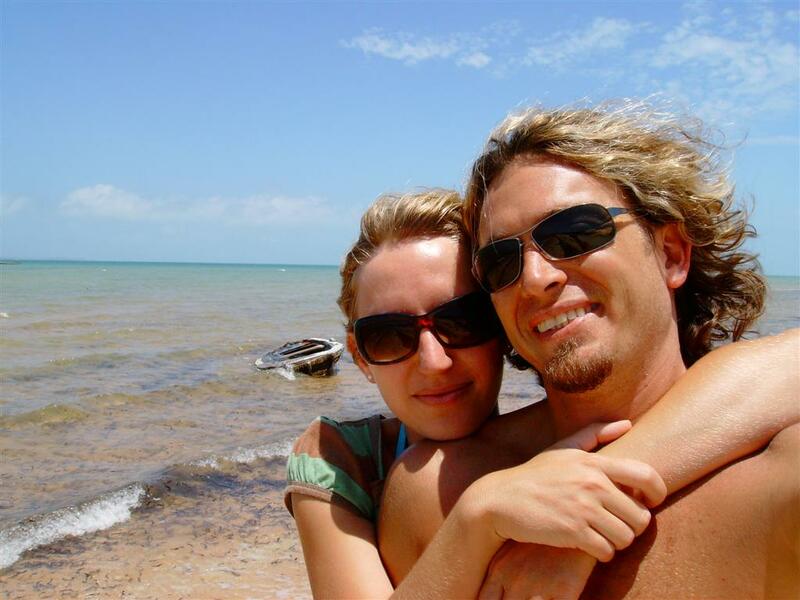 After quitting my job in 2002 we moved to Mozambique for work and lived a heavenly life there from December 2002 to December 2008. Since then we retired and is currently living in lovely Oudtshoorn. Hey julle twee! Stunning foto! Ek gaan julle trip dophou, geniet vir almal van ons. Wens ons kon ook so iets doen. All the best and may it be a very blessed trip! Like to bio of mom and dad. And great pic of them! Good luck Marius, wish I had the opportunity to go as well. Boa viagem!! Goodluck guys!! I’m glad to hear that you guys are actually on the road already! Keep the news and pics coming! EPIC! Dink maar aan die wat jy agterlaat in Luanda! Oooo Jitte jul moet dit geniet. Ons is BAIE Jaloers !!!!! Eendag koop ek vir my ook n Afrika Lorrie. Geniet elke oomblik en veilig ry – maar laat ons nou maar eelik wees, jul is so ge-kit daar kan mos niks verkeerd gaan nie, veral nie met 2x cruisers nie. Jul ALMAL is vandag ons my gedagtes en alle mooi memories van Nick. I noticed your truck parked at the Ocoee River Whitewater Center, USA, on April, 27th, 2012 at about 10:45 am.. Just wondering what it was about and looked up the web adress. Good day, i wish good trip for Marius+Debbie+Nick+Aka. Marius and Debbie, it was genuine pleasure to meet the two of you at fort McAllister yesterday. May God bless you and keep you safe in your travels. Nice meeting you both today …do plan to spend a day night with us in San Francisco..aditie n pradyut! I met this lovely couple in Oregon on the coast – I wish all the best the world has to offer. And please keep all of us updated. May the sun be at your face, the wind to your backs, and your travels safe. Thank you for spending time with us you guys are awesome may you be blessed. I saw you all at a Lowe’s store today in Alexandria, La. I got the web address off of your truck and searched it. Somehow I new this would lead to something interesting. I have lived here since childhood. My wife and I have a camp in south La. and fish the Gulf a lot. I envy you, thinking about the places you have been. Nice talking to you. Will log in and check on you later. Where are ya’ll headed from here? Hey Guys, and Gals. I saw yall in Abbeville Louisiana Today. I turned around and tried to catch up with yall… I was in the Tan Pickup… I think y’all just thought I was waving… I’m part of the Local Land Cruiser Club, and Freeked out when I saw a 70 Series. SWEET.. 😀 Are yall gonna be around town for a while??? The gumbo was better today sharing it with you! You two are special people & we enjoyed visiting with you, our South African friends. Ons het vrydag by die ontbyt ontmoet en saam geeet. Ek kon dadelik agterkom die twee mense is top class en wil julle net sterkte toewens in al julle aktiwiteite. Hey Marius and Debbie, In Congo. I see you’re probably still out and about. Had twins, boy and girl. Hope all is well. Russ. We find your METATE!! we return but you move, sorry my friends! Anyway we enyoined very much our experience metting people like both of you. We returned home very inpired. Nothing its impossible thanks for the experience in our hearts forever…. Hi Marius & Debbie. We think of you often and are checking to see where you two are currently. Enjoy all the wonderful memories we have had with you and miss you greatly. Enjoyed the write up on dad and mom. Hope we can get acquainted with them should we be fortunate enough to have them visit in the summer of 2013. Hello Debbie and Marius,it was nice to share with you in Minca, Magdalena Colombia, hope you are well, good energy on your trip. Leo and Ana from Bogota Colombia. Hey Oom Nick, Tannie Lillian, Marius en Debbie ons miss julle hier in Suid Afrika! Ek sukkel om julle in die hande te kry en weet van geen anner manier as hier nie! Ek hoop julle kry die boodskap! Ek en Celeste is verloof en ons Trou die 2de Novemebr! Julle is eerste op my trou lysie gewees en ons sal graag die dag saam julle wil deel! Drop my n email of geen my n lui as julle die boodskap kry! Ons vertrek na Dubai op die 5de om daar n lewe te begin vir n paar jaar maar het so baie om met julle te deel! Hoop die travels is amazing en weet julle het n klomp pelle hier is RSA wat julle mis! We met your Mom and Dad at Monarch Pass Colorado, USA yesterday for just a couple minutes. Would have loved to had more time but like them we are traveling also. I first noticed their FJ75. I wish we could get those vehicles here in the US. We will watch your blog. holaaaaaaaaaaaaaaa chicos!!!!!!! por donde andan???? somos caro y gaby, los chicos del condor, jajajaj. tango is old, jajajja huele a viejo, jajja. Ya estamos en casa cuando quieran, estan invitados!!!!! Hi!!! We’ve seen you tomorrow morning in the 25 de Mayo highway. We love the way you’re travelling, Congratulations!!!!. Fortunatelly, we manage to organice trips round to Argentina, our lovely country. We like to invite you to join us to our next off road trip to Neuquen – Mendoza, we hope to arrive at Laguna Fea y Laguna Negra, they are two wonderfull lakes. We´re planning it to the end of February (29th February to 4th March) Please write us!!! Congrats !!! Great journey and spirit !!! Saw you yesterday at San Antonio de Areco. I took some photos of your incredible “Chata” (as we call here in Argentina; a good truck). It will be a pleasure to be in contact. I’, writing a book about our relationship with nature and it will be nice to include some experiences of your travel around the world. My name is Patricio Sutton. I live in Buenos Aires with my wife and two sons. If you want to have a great dinner or meal at house don’t hessitate in contact us. patriciosutton@comunidadesrurales.org I work in a social organization http://www.comunidadesrurales.org Bye !!! are you guys still traveling?